The Aladdin Lox On Chimney is made of high-quality, durable Borosilicate glass. Borosilicate Glass is also known as Labratory Glass or Pyrex Glass. Features white Aladdin "Stylized" Logo at top of Chimney. Images show colored background to highlight current Aladdin logo. Chimney is made of clear glass with white logo. 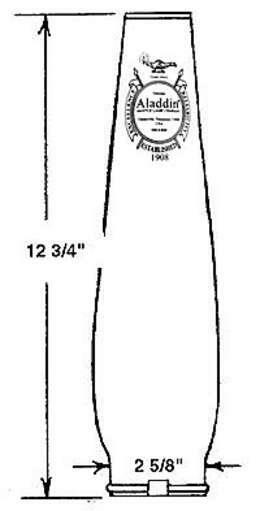 The Aladdin Lox-On Chimney was originally introduced with the Model 12 burner, setting it apart from other kerosene and coal oil lamps on the market at that time. The unique Lock On style features a twist and lock design. 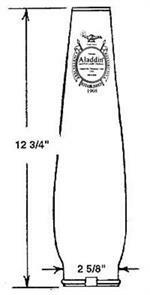 The Lox-On Chimneys have three small tabs at the base of the chimney which corresponds to the three metal tabs on the Lox On Gallery. These tabs meet up to hold the Aladdin chimney securely in place. 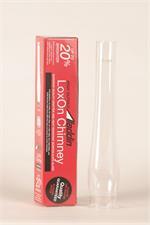 This Lox-On Glass Lamp Chimney can be used on both Aladdin kerosene and electric burners.